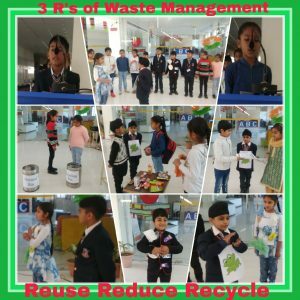 An assembly was conducted by the students of Grade 1 & 2 on the topic 3R’s (Reduce, Reuse, recycle). The assembly started with the school prayer followed by the thought of the day. Student introduced the concept of 3R’s. They presented a skit in which they laid emphasis on the importance of reducing the consumption of the things which are polluting our environment, reuse the things wherever possible and recycling the waste to make the world a better place to live in for the coming generations. They also advised all to make earth clean and green…. Save Earth Save Life. Thank you for your blog article. Really looking forward to reading more. Definitely, what a great website and instructive posts.All the Best! Keep up the excellent work, I read few blog posts on this web site and I believe that your web blog is really interesting and contains circles of excellent info. Thanks for one’s marvelous posting! I seriously enjoyed reading it. I want to encourage you to continue your great work, have a nice evening!